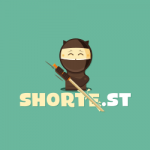 Shorte.st is a European company that has connected a link shortener with an advertising network. Its system enables users to get paid by shortening website links to ads and encouraging others to click on them. The company also offers various other tools to help clients earn money. The system can be used to monetize a blog or an entire website. You don’t even have to run a blog. Shortened links can be placed anywhere, including on social media profiles. The site, however, is more than just a simple link shortener. The monetization tools help increase earnings and the registration process is quite simple. You can be paid via PayPal or Payoneer. Another benefit and difference of Shorte.st over competitors is there are no ads or any space taken up on the client’s webpage. When links are clicked, ads are displayed on intermediate pages. Visitors are then directed to the destination URL within five seconds. A coupon code is now available so you can take advantage of this innovative link shortener. Please see more details below. MonetizePros have an exclusive Shorte.st Coupon. This limited time offer will get you an additional 10% extra earnings for three months. Create a new account in Shorte.st using our coupon below. All you need to do is click on the discount coupon, register, and start earning 10% more when you use Shorte.st. Our discount code is all you need to increase earnings on the site. In addition, the company is also offering customers a 20% commission on referrals over an entire lifetime. You can continue referring friends and earning on that so there are a multitude of ways you can boost earnings using the site. Use our coupon code to get started and you may see a consistent flow of earnings. Shorte.st is legitimate. It is rather simple to get started and the link shortener and setup enable you to profit without having any webpage space taken up. All ads are placed on the other side of the links. One notable fact is payout rates are different depending on the country you are in, while content is available in English, Spanish, and Russian. Rates generally range from $0.3 to $1.66 but go higher in places like the USA, Canada, the UK, and other parts of Europe. We found a good list of rates per country on the company’s website. These include over 100 countries and information from more than 320,000 users. You can also share the shortened links anywhere you like. This includes Facebook, Twitter, and other social media sites; Shorte.st helps to avoid having longer links flagged as spam. The revenue you make depends on the rates in the country from where a user clicks. With the techniques Shorte.st provides you can make over $100 per month. Too many links, however, may tend to visitors but we’ve found that some social-based short links can be effective. The company claims to pick only premium ads. It also provides real time statistics and the biggest payouts possible with the given links and country rates. You can also take advantage of other methods. Sharing image links on Facebook, video links on YouTube, and blog post links can boost earnings. The various other tools and features provided, and which you can increase profits with, are listed below so you get the most out of your coupon code. To register, all you have to do is click the “join” tab. There are only three fields: email address, confirm email, and password. Once you accept the terms & conditions, click the “register” button, and you’re in. A confirmation email will arrive in your inbox. Following registration and use our discount code. You’ll get a prompt to connect to Facebook and then you can complete account registration. Sharing a link is simple. A statistics page provides a quick share option for each short link, but you can share links manually. Copy and paste a short link to any site or social media page. There are many other tools, including an API and quick links, which let you copy the destination address with an API token in the tools section. Puts all links on the page into shorte.st form. All you have to do is copy the appropriate code and paste into the body of your HTML code. Also, specific domains can be excluded or included on command. Website scripts can be configured to your needs in order to monetize visits to your website. Provides a code with a personal ID token. Copy this and change the “Yourdestinationlink.com” in the supplied code to the link you want. Up to 20 URLs can be shortened simultaneously. Can be placed on the exact page you want to share and earn from. Clicks in social buttons will automatically be processed and shortened to expand your revenue-making opportunities. This feature allows you to add short links on Facebook, Twitter, and Google+. With the up-to-date statistics provided, you can see where the most earnings are coming from. This enables you to plan and modify strategies. Increased profits are therefore more likely. Support for the most popular website and blogging platforms expands your horizons for monetizing sites and blogs. According to the company’s website, dedicated assistants are available to help customers and are always resourceful. Not only does Shorte.st give you the tools to easily shorten links and post URLs. It lets you track progress and apply monetization strategies to any website, blog, or online platform. Also, it works with social media. Additional tools also save you time in the process, while support is available to assist you at any time. The opportunities are pretty much unlimited so take advantage of our discount code and get started today.